Bánh Xèo, pronounced as "baan say-oh", literally means cake sizzle in direct translation. Xèo refers to the sizzling sounds made when the batter touches the hot pan. This nostalgic dish brings back fond memories for Mrs Nyugen and it is a family favourite when her siblings gather every year on 5th May to usher in the 2nd half of the year and to also celebrate a smooth-sailing 1st half. 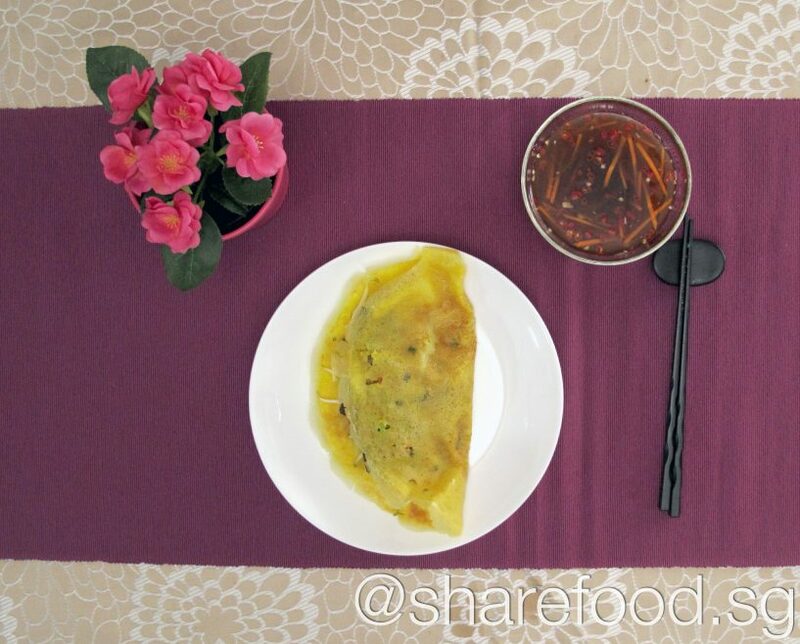 Lucky for us - we were privileged to have savoured this wonderful dish prepared by Mrs Nyugen. Many (including us!) might not have even ordered this dish at a Vietnamese restaurant! Don't be fooled by Bánh Xèo's plain yellow appearance, chunky pork belly filling is tucked beneath its crunchy turmeric crepe! And its taste? Without a doubt, far exceeds the humble appearance and our expectations! To fully appreciate the flavours of this dish, Bánh Xèo must be served straight from the pan. Crispy on the outside but soft and tender on the inside. Complement this dish with a zesty fish and chilli sauce and your taste buds are on its way to heaven! 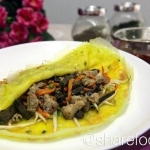 If you're in Vietnam, don't forget to try some Vietnamese crepe! 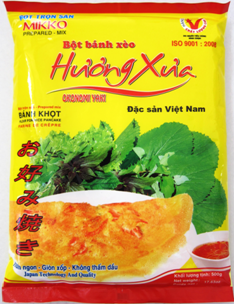 If not, we highly recommend that you try Bánh Xèo at home because we are sure it is definitely worth it! Or better yet! Gather a few friends and have everyone prepare a few of the ingredients! Cook this dish together and share it! As the saying goes, Friends who cook together, stay together. Let this be your 1st dish! Don't be fooled by Bánh Xèo's plain yellow appearance, chunky pork belly filling is tucked beneath its crunchy turmeric crepe! And its taste? Crispy on the outside but soft and tender on the inside. Complement this dish with a zesty fish and chilli sauce and your taste buds are on its way to heaven! This is the flour that we have used for this dish. You can purchase this from Golden Mile Complex Singapore.